As Tech Firms Come To Oakland, So Do Hopes Of Racial Diversity : All Tech Considered Oakland, Calif., is known for being diverse. The tech industry? Not so much. But there's hope the situation will improve as more tech companies move to Oakland. Adan Faudoa landed a job at Pandora, one of the first tech companies to set up shop in Oakland. 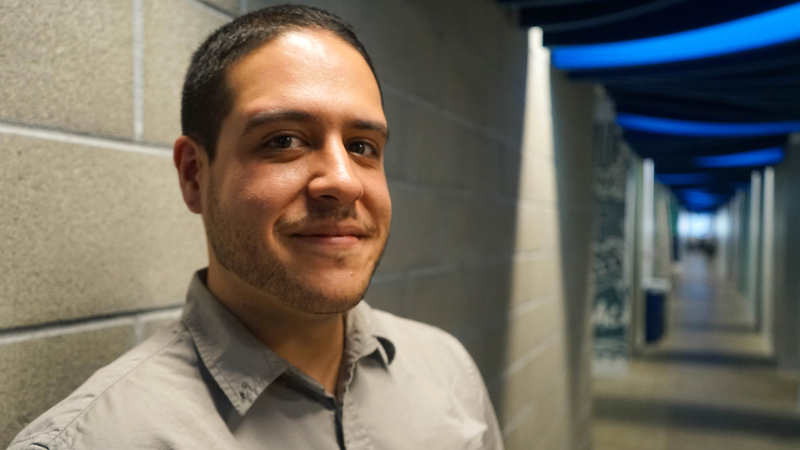 Adan Faudoa, 24, grew up in the Bay Area, near Silicon Valley, but he didn't always think he'd be a tech guy. His dad had other plans for him. "As a kid, my dad was a big gear head," Faudoa says, "so, he was pushing me in the direction, like 'You have to be an auto mechanic, Adan, because this is where the money is at.' "
But over time, Faudoa began to see things a little differently. He noticed the people moving into his neighborhood were programmers and people working for tech companies. He decided he'd fight hard to become one of them even though there aren't too many people of color in the industry. In the end, he landed a job at the music streaming service Pandora, one of the first tech companies to set up shop in Oakland. Now, there's an emerging startup scene. Tech pioneer Mitch Kapor also gambled on Oakland. Kapor says that in the not-so-distant past when he told people that tech would come to Oakland, they were skeptical. "Five years ago, people thought I'd grown a second head," Kapor says. But Kapor and his wife, Freada Kapor Klein, saw Oakland as the perfect place to carry out their shared mission: to create diversity within tech. "There's all of the platitudes that diversity's good for business," Kapor Klein says. "But you look around tech, and you look at how hugely profitable companies like Google and Facebook — all these behemoths — and they're staggeringly undiverse, and they're doing just fine. So we need to focus on different strategies." The Kapors invest in strategies that eliminate bias in the tech industry, whether it's through new training programs or by redesigning the application process and performance reviews. Kapor says that sometimes the culture of the workplace itself can be the problem. "If a company is made up entirely of, let's say, recent Stanford graduates, maybe fraternity brothers, and there's sort of a bro culture, you're going to feel left out," he says. "You can't actually be who you are." At Clef, a data security startup in Oakland, some of the founders did originally meet through networks in college. But now they're trying to bring the local community in by opening up their offices every Wednesday night for a free dinner. At a recent free community meal, where the crowd skews mid-20s and early 30s, there are plenty of tech and media types. Darrell Jones III, one of the event organizers, says firefighters, public officials, even the bartender from down the street, sometimes will show up for a plate. 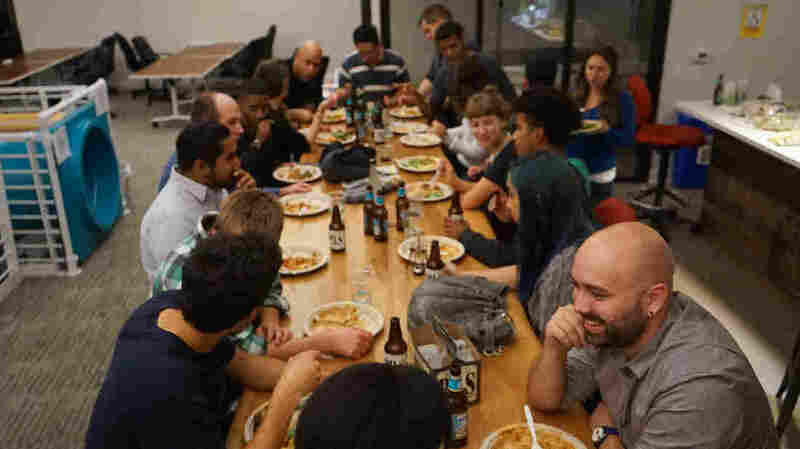 A recent Wednesday community dinner at Clef, a data security startup in Oakland. "I'm hoping that the culture of Oakland is just an overwhelming wave against any type of invading horde of 'tech bros' coming in," Jones says. "Through this smaller kind of community-centric local open event, we hope that we're able to [build] strong bridges between Oakland tech and just Oakland." "Just Oakland" means the blue-collar workers who settled here during World War II. The artists, the hippies, the entrepreneurs. The educators and the political activists. The people who've emigrated from East Africa, the Middle East, Central America and Southeast Asia. "Just Oakland" is this town's history as one of the strongest communities for blacks in America. Oakland is already changing with the arrival of tech. But the question is: Will the tech industry change, too, and become more diverse as more companies move in? Uber is the latest newcomer to town, and it is taking over the former Sears department store in the heart of downtown. Oakland Councilmember Lynette McElhaney says that it's critical that Uber let "Oakland in." That's what'll make the difference in terms of equity: Oaklanders having a real place at the table in tech companies — and not just for a weekly dinner. Pendarvis Harshaw's story was produced by Youth Radio.